Released after two developer betas, watchOS 5.1.2 can now be downloaded and installed to an Apple Watch by using the iPhone's Watch app. Users need to select My Watch within the app, followed by General, then Software Update, and then to enter the iPhone or Apple Watch passcode if required to start the installation. Apple advises users should keep the Apple Watch on its charger while the update completes the installation process. 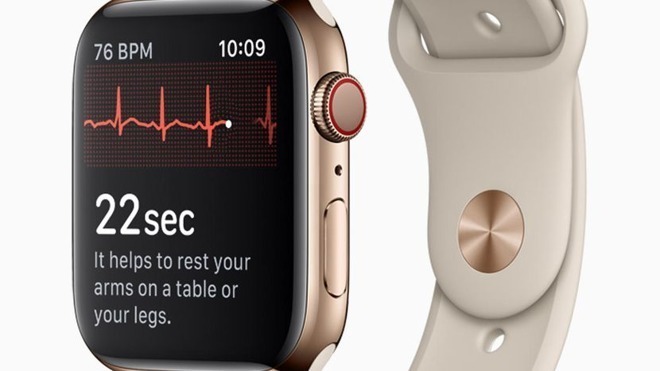 The headline addition in watchOS 5.1.2 is the ECG app, which can be used to monitor the user's heart via electrodes in the back crystal and the Digital Crown. After a 30-second test, the app classifies the readings as atrial fibrillation (Afib,) sinus rhythm, or inconclusive. Recordings, classifications, and noted symptoms are stored in the Health app on the iPhone, which can then be shared with a user's physician. The ECG feature is currently only available in the United States, after it had received FDA approval. Apple intends to enable it in other markets, but that depends on acquiring regional regulatory approval. Another heart-related feature is the Irregular Rhythm Notification, which will work for all Apple Watch models from the Series 1 onward. Using the optical heart sensor, it performs checks of a user's heart rhythm in the background for signs of irregularity, and will warn users to gain medical advice from their physician if enough checks show symptoms in a short space of time. The watchOS 5.1.2 update also includes some changes that are not directly health related. New complications for the Infograph and Infograph Modular faces add extra elements for Messages, Home, and Mail, making them more useful to users. AppleInsider is going through the update to see what other additions have been made to the release. This is Apple's fourth operating system release this week, after shipping iOS 12.1.1, tvOS 12.1.1, and macOS Mojave 10.14.2 on Wednesday.